From trendy glass to clean minimalist, the design and style options are endless. The most important thing to remember when choosing your kitchen backsplash style is to choose a style that makes you happy. Don’t be afraid to express yourself. However, keep in mind that your kitchen backsplash will be a defining aspect of your space. 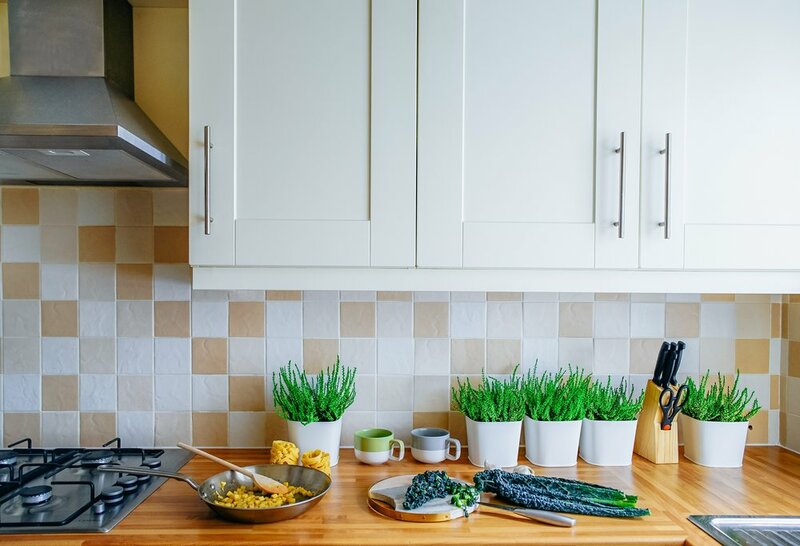 Another important factor to remember is that your new backsplash needs to match your existing kitchen décor. Strive to create an overall theme among your countertops, walls, work area and floors. Once you’ve decided on your style, it’s time to start the installation process. While choosing a kitchen backsplash design is difficult, actually installing the tile design may prove to be even more difficult. Measure your wall to determine how many tiles you will need. If you are only covering one section, multiply the width and height of the wall to get the square footage. You will want to have extra tile on hand to fill any small gaps or replace damaged pieces. Before getting started, you need to make sure the clean your wall to remove any grease or other debris. Using a sponge soaked in a mixture of water and dishwashing liquid will do the trick. Be sure to tape off the countertops and any cabinets that will have tile installed along the side and to cover countertops with a drop cloth. Turn off the power and remove the cover plates from all outlets. You want to start applying your tiles in the center of the backsplash area. Make a centerline on the wall halfway between your cabinets and the vent hood of your stove. Finally, measure from the centerline to the cabinets. Place your tiles along the wall and mark your beginning and ending points. You want your starting point to be the most visible area on the wall. From there, place the tiles outward and upward. Maintaining a straight line isn’t easy. We recommend using a straight edge or level to help keep your tile even. There is a chance you’ll need to cut tiles for them to fit properly. For porcelain or ceramic tile, use a tile cutter. If you are cutting natural stone, you will need to use a wet saw to prevent any chipping or breaking. Prepare and apply the mortar. To prep your mortar, fill a bucket with water and gradually add in the powder, mixing thoroughly. Let the mixture sit for 5 to 10 minutes, then begin mixing again. Do not add more water. Once the mixture is finished, you will not have very long to use it. After about 4 hours, the mixture will be dried up. Start by spreading a thin layer of mortar over a 2-foot section with the flat side of your trowel. You want to press at a 45-degree angle to make sure the mortar fully adheres to the wall. It is best to work in small sections to make sure your mortar doesn’t dry as you apply your tile. To remove excess mortar from the tile, you can use your same sponge from earlier. Begin with the bottom row at the center mark. Press each tile firmly into place into place. If necessary, place spacers between each tile. If you cut corner pieces to fit properly, do not place them until closer to the end. Work upward and one row at a time. Every once in a while check to make sure your tiles are secure. Use a straightedge to make sure each row is level. After a few rows, check to see if the corner tiles still fit properly. If not, recut the tiles then place them. If you are tiling a very small area with you can’t fit a trowel in, apply mortar directly to the backs of your tiles. Once you are finished, we recommend letting the mortar dry for 24 hours before beginning the grouting process. Clean and grout the tile. Carefully choose your grout. You want grout that is going to protect your new kitchen backsplash from splatters and stains. Mix the grout until it reaches a thick consistency, then begin applying it to your backsplash with a grout float. Work the grout diagonally over the tiles while holding the grout float at a 45-degree angle. Use the grout to scrape off the excess grout. About ten minutes later, wipe the grout off the tiles with a damp sponge. If you notice the grout coming out from in between your tiles, wait an additional 10 minutes. Most of the grout should come off, but if you want your backsplash completely clean, try using a toothbrush on each individual tile. If you want to apply a sealer for additional protection, wait about a week before doing so. Then, your new kitchen backsplash is complete! Are you ready to transform your kitchen with a custom backsplash, but don’t think you’re up for the challenge? Don’t let the time commitment and amount of work stop you from having your dream kitchen. Call One Man & A Toolbox today for a quote or fill out the form below to request a service online.